Cafe Bay Leaf, a 24-hour fine dining restaurant, offers a variety of global favourites buffet style. An outdoor swimming pool, gym, tanning beds, sauna and steam rooms help guests relax and rejuvenate. This upscale hotel is just a 5-minute drive from IT hub in Hinjewadi and Symbiosis Institute. Modern and spacious, suites include a separate living room, large work area and floor-to-ceiling windows. A fine selection of whisky, coffee and snacks at ConneXions Lounge and Bar- the stylish cocktail lounge. Sip on a glass of whisky or signature cocktail and sample delectable finger foods at Felix Bar. Book your stay in a King Studio Room and enjoy a furnished seating area and floor-to-ceiling windows. Location:A 40-min drive from Pune Junction Railway Station and 23 km from Pune Airport, Holiday Inn Pune Hinjewadi is just 5 km from the IT hub in Hinjewadi. Nearby attractions include the magnificent Sri Balaji Mandir (8 km) and Chaturshrungi Temple (12 km). Room Amenities: There are 172 well-appointed rooms at the hotel. The rooms are well equipped with modern amenities like Wi-Fi, LCD TV, coffee/tea maker, in-room safe, iron/ironing board and a workstation. Private bathroom has hair dryer, bathrobe, slippers,3-function massage rain shower and essential bath amenities. Hotel Facilities: These include in-house gym with steam and sauna room, outdoor pool and 24-hour business centre. The hotel also provides concierge, currency exchange, laundry service and Internet. Dining:Cafe Bay Leaf is a 24-hour coffee shop. There is an interactive buffet kitchen facing the side of the pool. ConneXions Lounge and Bar serves snacks and drinks. Enjoy 2 pints of beer once during your stay. Room was excellent. Location is a bit isolated. Experience was nice and refreshing staff is cooperative. Clean and hygiene maintained rooms. Courteous staff. Good breakfast selection. Bang on National highway. Breakfast lunch dinner fantastic. Rooms too good. Recommended to all. Visited 9th time. And shall continue to do so. Hotel staff is really very good. Extremely satisfied with the room and its interior. Breakfast was of utmost quality and taste. Extremely satisfied as always. Love coming here. Pune highway is a good location of this hotel. Very convenient to avoid City traffic. Small one day trip to Pune. Ended on a sour note that the staff forgot a piece of luggage and we had to wait an hour till they sent it to us. Stayed in the property as it is very close to balewadi stadium where I had to play my badminton tournament. Comfortable stay. Rooms are quite bigger than other hotels in Pune. Hotel staff behavior is good. Nest and clean rooms. Food not that much tasty. Clean hotel with average food and ambience. We planned a two days trip. Were to reach on Saturday noon and depart on Monday early around 5 hours. So we contacted the reception wondering if Monday's breakfast could be provided on Saturday itself as we have to check out early on Monday and also incidentally we reached in Saturday during breakfast timing. Unfortunately, the Holiday Inn Pune Hinjewadi had displayed its reservation to this stating that it cannot provide Monday is breakfast on Saturday check-in period. Eventually, we decided to make stay only for one day sat. Although, we like the overall hospitality, but the gesture could have allowed us to continue staying for the second day as well Sunday. Understandably, its Holiday Inn Pune Hinjewadis stringent rules, that the staff have to abide by. Otherwise, the property is very nice, we love it. My stay at Holiday Inn Hinjewadi was pleasant. While booking please keep in mind this Holiday Inn Pune Hinjewadi is on the Mumbai Pune Highway and the Holiday Inn Pune Hinjewadi authorities should do something about the approach road/service road to the Holiday Inn Pune Hinjewadi. This is a business Holiday Inn Pune Hinjewadi with all the required facilities. I stayed in King room. The room has an additional table and chair. The breakfast spread was very nice and the food preparation too was good. Overall good experience. I found the rooms comfortable but room service and house keeping not so comfortable. The rooms are standard as one would expect in a star property. The Holiday Inn Pune Hinjewadi is located quite far off from the main city as well as about 40 kms from the airport. The food and spread in meals are good. The food is good. The bar, the gym, WiFi and other facilities are up to the mark. Enjoyed my stay at Holiday Inn. Was there for just one night for business travel. The room was spacious and clean. The bed linen and the bathroom linen was clean. Good choice of in-room entertainment. The food portions were very generous. I had a room only package and thus didn't check out the buffet breakfast. Overall. Recommended for a business or pleasure trip. Stayed here over the weekend, with my friend. Hotel staff was very friendly and provided excellent service. Room was good and clean, comfortable bed and pillows. TV size was good. Washroom was clean too. Spacious. Overall nice room. There is a speaker in the room, which has radio and you can also connect your phone to it using an aux cable. Great sound. Lovely Holiday Inn Pune Hinjewadi. Conveniently located on a highway. Rooms were simply awesome. With all in-room amenities. Smooth & prompt check-in and check-out. With a deal from MMT, we got a superb value for money deal. Service was good too. We ordered omelette for breakfast which was wholesome and worth money spent. Overall perfect stay at Holiday inn. Enjoyed every bit of my stay. It was a superawesome experience ... Loved the hospitality of the staff. Woryh every bit of money spent. The rooms too were big and spacious very happy with our stay there. I was carrying an infant along the staff there was so full of warmth that they made it very easy for my baby too whatever I required they made sure it was there at our doorstep. The services were great. The room was cleaned each day. The room service was quick with great food. I faced no problems whatsoever. A great place to stay. One of the finest Holiday Inn Pune Hinjewadis I have stayed in. They gave me an early check-in and even the check-out was quick. If anyone is in pune this is the place to be. Located in very excellent area.. Beautiful ambitious.. Very supportive staff of reception.. Helping us making food for my 10months grand son.. We definitely to stay in holiday inn.. Enjoyed a lot and relaxed.. Awesome food staff are very supportive.. God bless you always successful growth.. Thank you.. Have a great day ahead. First off all I really want to appreciate the Holiday Inn Pune Hinjewadi staff, they were so polite and helpful. Also the room service, it was the best I have ever experienced. Food quality and taste were excellent. Must stay if you are willing to have some quality time. Just love it. Thank you for making my stay memorable. 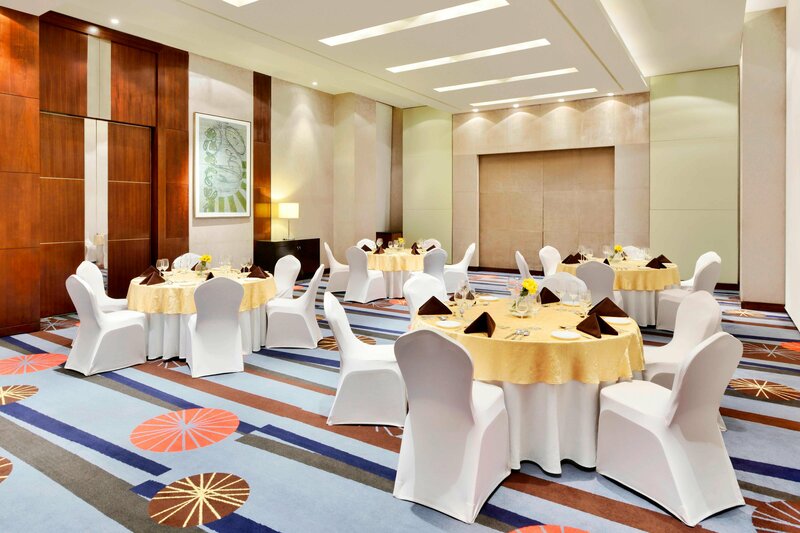 They have good service with all the amenities you can expect from the Holiday Inn Pune Hinjewadi. The only downside is it is far from the main city. Great hospitality. Staff is courteous. Scrumptious and largely spread buffet breakfast. Good comfortable affordable stay. Breakfast spread and quality was quite decent. Jetspray in the toilet was leaking. One of my fav hotel. Very nice and conveniently placed Holiday Inn Pune Hinjewadi. Breakfast has too many options, close to tech hub of Pune. Access was not easy but they are working on it. If you have work In Hinjewadi, the place is for you! It was a very comfortable stay . Breakfast is not very good as I was staying one day before also. So the dishes were repeated with same flavour . Otherwise I am a regular visitor to this Holiday Inn Pune Hinjewadi it is very nice staff is also cooperative . A good Holiday Inn Pune Hinjewadi. No bathtub in the bathroom provided. Good location, food and staff. Was a perfect stay. Staff was very courteous and helpful. Food was awesome. Comfortable stay over all. Convenient location. Comfortable stay. Checked in late in the night. The shower did not have enough hot water. Disappointing after long day. Overall good experience with good food quality and nice room. Stay was nice, room was clean. We got a room with a view. Stay was nice, room was clean, we got a room with a view. As a member offered two pints of beer. The Holiday Inn Pune Hinjewadi location was good. Room was spacious. Room was good. The room temperature was perfect. Superb stay. No problem faced. Breakfast buffet was nice. Recommended to all. You should provide driver stay free of cost. Very good buffet spread, attentive staff and maintained rooms and swimming pool.